A 12-year-old girl is believed to have become the first UK patient to have her heart transplant reversed. Doctors at London's Great Ormond Street Hospital acted when Hannah Clark's body rejected her donor heart - 10 years after her original transplant. The donor heart was disconnected, and Hannah's own heart - which was never removed - was able to cope on its own. 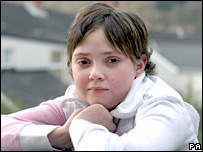 Hannah, of Mountain Ash in south Wales, is now said to be recovering well and looking forward to returning to school. 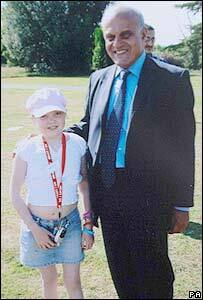 Sir Magdi Yacoub, who performed Hannah's original heart transplant when she was two, advised surgeons who carried out the operation on 20 February. He described it as a "very happy ending". "There was an outside possibility that her heart would recover, so that was the idea and it worked out. It's really wonderful," he told the BBC. The original operation saved her life because she had cardiomyopathy, which made her heart double in size and risk giving out within a year. The donor heart was able to take over most of the role of pumping blood around Hannah's body, effectively allowing her own heart, which continued beating too, to rest. Her donor heart worked fine until last November when a routine check-up showed that her body was rejecting it. Hannah's mother, Elizabeth Clark, said the operation, which had been expected to take at least eight hours, was finished in just four. She said: "They also said she could be in intensive care for weeks, maybe months - they just didn't know because it was the first time it had been done. "Hannah recovered so well she was able to come home within five days. "Nobody thought she would be like she is now. "She is just enjoying her life and is looking forward to going back to school after Easter." Hannah was "trying very hard" to lead a normal life, her mother told BBC News. "She is an outgoing girl and she just wants to enjoy her life." The family would always remain grateful to the donor "who gave us Hannah's life", she added. "We would not be sat here today if it wasn't for that donor." And she appealed for more people to come forward as organ donors. "We really need people to know that they need more donors on the transplant list." Meanwhile, Hannah said she felt "really great". Following the operation, the 12-year-old no longer needs to take strong anti-rejection drugs she had to take with the donor heart. She has also battled lymph cancer in recent years but is now in remission following a successful course of chemotherapy in January. Professor Peter Weissberg, medical director of the British Heart Foundation, described the operation as "an exciting and important event". He said: "Surgeons have thought for some time that if a heart is failing because of acute inflammation, it might be able to recover if rested. "This seems to be exactly what has happened in this case. "The piggy-back heart allowed the patient's own heart to take a rest. "Today the approach would be to implant a mechanical heart, called a ventricular assist device, to take over the work of the inflamed heart in the hope that the heart will recover and the device can be taken out after a few months. "Ten years ago, such devices were not sufficiently reliable, which is why Hannah received a donor heart alongside her own. "This is a great example of how a pioneering and novel approach to a medical problem can lead to surprising results that tell us a lot about how some heart diseases progress. "In the past, patients with inflamed hearts either died or were transplanted before their own hearts had any chance of recovery."